This week’s recipes are a double-double feature. I made the guacamole, and Tom made the chili. Chili is one of his specialties, a dish often invented as he goes along. I’m the main recipe follower of the family, but he’ll consult one sometimes. So here you have the fruits of our dual labors for a recent dinner. The way I usually make guacamole is based on a recipe of Diana Kennedy’s: a mashed avocado, mixed with chopped onion, tomato, serrano pepper, and cilantro, plus a little salt. Easy, tasty, zingy on tortilla chips. 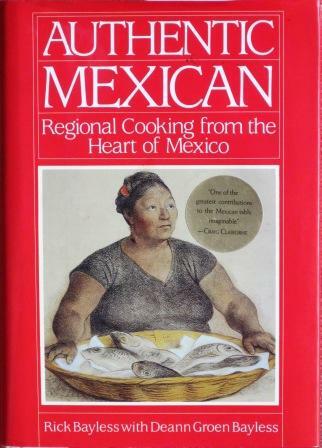 But I thought I’d try a little different approach this week, so I turned to Rick Bayless’s Authentic Mexican cookbook. He starts his Chunky Guacamole with the usual chopped suspects – onion, serrano or jalapeño, tomato, and cilantro (the last two both optional, but I used them), plus garlic (which I don’t, but did this time). He puts these in a bowl and lets them get acquainted, then mixes them into the mashed avocado, along with salt and lime juice – the last also not one of my regular ingredients. Then, to serve it, Bayless suggests several additional garnitures: more chopped onion and cilantro, radish slices, the Mexican cheese queso fresco, and more lime juice. So I did all that too. It wasn’t too much different from my regular guacamole. Mine has proportionately more tomato and more hot pepper. Tom sees to that last item! The lime juice was nice on it, the garlic barely noticeable, and the cheese very bland. Nice for a change, but I’m likely to stay with my usual version. 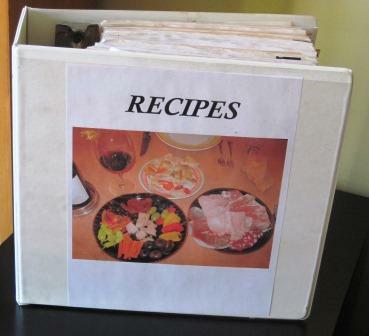 For the chili, Tom chose a recipe called Fiery Chili with Red Beans from my giant recipe binder. The page it’s on is a photocopy so old that I can’t remember when or where I got it. Since the bottom of the paper says “Cuisine Economique,” online research suggests that the recipe may be from Jacques Pepin’s cookbook of that name, but it’s a book I’ve never owned. However that may be, I had the recipe, and now Tom has made it for the first time. 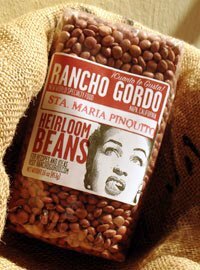 The beans he used were one of our favorites: Santa Maria Pinquitos, a lovely, smallish pink bean that we buy online from Rancho Gordo. The family chili-maven says they are the best beans for chili he’s ever encountered. 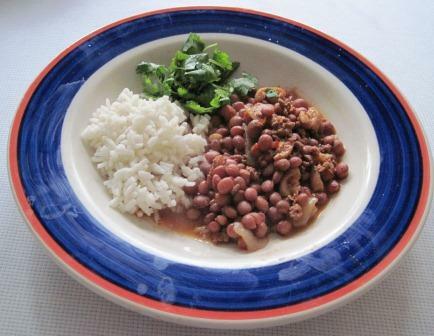 First, the beans are boiled in plain water until barely done. Next is the meat mixture. One unusual ingredient in it is pork rind, cut small and rendered out. The chopped beef is browned in that rendered fat, along with onions, and then gets an addition of garlic, jalapeño, and tomatoes. Then comes the heavy stuff: chili powder, red pepper flakes, ground cumin and coriander, dry mustard, salt. That highly seasoned meat is stirred into the bean pot, which then simmers gently for an hour or more, perfuming the kitchen most appetizingly. Here’s the chili as we served it, with plain rice and a few leaves of cilantro. We also had more chopped onion and some grated cheddar to stir in, and warm corn tortillas to scoop stuff up with. It makes a decent chili, tasty enough, but hardly “fiery,” unless your palate is totally unused to spicy food. I’m not sure that the pork rind, coriander, or mustard added anything perceptible to the dish, though I always like a touch of cumin in a chili. I would have preferred more fresh chilis and less chili powder; I think you get a fresher, richer, and more complex flavor that way. For me, a good chili doesn’t sear, and it’s never simply hot. It warms, yes, but it intrigues too. This one was straightforward and one-dimensional: to my mind, a non-chili-maven’s idea of chili. Edible, for sure, but hardly worth doing again. So, all in all, this was not a meal for the memory books, even though it made a pleasant enough dinner. One nice thing about recipes that aren’t quite as good as the ones you usually use: They make you appreciate your familiar ones more.